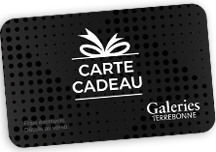 With the Galeries Terrebonne gift card, you get added security. Unlike gift certificates, Galeries Terrebonne gift cards have security features that protect you in case of loss or theft and allow for easy replacement should the need arise. A $ 2.50 fee (plus applicable taxes) will be deducted monthly from your card starting 16 months after the activation date. If you call before the end of the 14th month, the 16 month period will be extended to 19 months. The Card is subject to terms and conditions stated in the Cardholder Agreement. An additional copy of the Cardholder Agreement may be obtained from the service representative prior to purchase. Unless prohibited by law, the Card is subject to a monthly maintenance fee, which will be assessed automatically against the Card in the amount and on the timing stated on the back of the Card. The name of the card issuer, as well as a toll-free phone number to make inquiries are also stated on the Card back. Please note that funds do not expire, the Card is not reloadable, not redeemable for cash, unless required by law, and is not CDIC or DICO insured. *The following Galeries Terrebonne retailers do not accept gift cards: Amir, Buzzfit, De Fil en Aiguille, Grif & Graf, Jolis Ongles, Les Planchers Payless, Loto-Québec, Maki Sushi Express, Pizza Déli, Tiki Ming and Vidéotron. Other retailers may have been added to the list since the last update of our website.